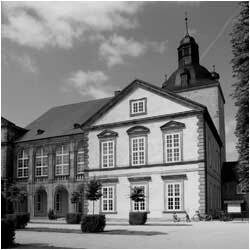 Haus des Waldes or Forestry House is the central information and communication centre of the Saxony-Anhalt Forestry Department. It introduces the symbioses of the forest's various inhabitants (both plants and animals) and explains the forest's significance for mankind and the environment. One of the aims of Forestry House is to encourage environmental awareness. In addition to learning facts and figures, visitors can look forward to a practical hands-on experience in the special exhibition concentrating on various aspects of the forest. The range of activities offered by Forestry House includes educational nature trails designed for various target groups. Seminar rooms are also available for hire. A host of cultural events and special exhibitions are held under the banner ''Art and nature''.